I read a lot of comics, and a lot of manga. The genre conventions can get a little old after you've read, say, a few dozen magical girl series. So I find myself re-reading older books that I have an emotional attachment to (Don't ask me to be objective about Sailor Moon. It's too late for that.) or ones with unique, even thought-provoking premises. 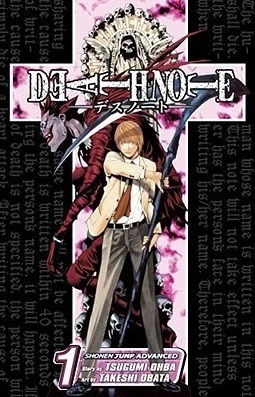 And believe it or not, Death Note is one of the latter. This is the simplest summary of the series I can give, because it gets very complicated, very quickly. This is a very wordy, internalized series. Most of the panels show the thoughts of the characters, mostly Light and L as they continually plot and counterplot against each other. Both Light and L are smart enough to think several steps ahead of everyone else around them. At one point, Light's plot becomes so complicated that I would need a flowchart to explain it, with L just one tiny slip away from exposing him at any moment. It's an effort to keep up, and this is not a series for people who require constant action. That's all aside from the many convoluted rules on how the Death Notes actually work, some of which never become relevant to the plot. This is the kind of series that sparks debates. What's the difference between justice and murder? Is Light's vigilante justice morally right? Or is he just another crazy killer? Does the criminals he targets deserve death? Given that, by the end of the first volume, he's responsible for the deaths of hundreds, what does Light himself deserve? Does it make a difference that L is less concerned with justice than in solving a particularly tricky brain teaser? What would drive someone to worship Kira? Would Light's utopia really be a better place? For whom? Luckily, the manga is as neutral as possible, making both sides (and their representatives) sympathetic and flawed in roughly equal measures. And are they ever flawed. L is the sort of character who can be fun to read about in fiction, but who would be very hard to take in real life. He's wildly eccentric, frequently rude, seems to lack empathy for people around him, and, significantly, is more interested in the case as a battle of wits than as a chance to stop a murderer. Light is much more polished on the surface, and a lot less likely to offend people around him, but there's something deeply off about him, more and more so as the series continues. Other characters are little more than background to their conflict. 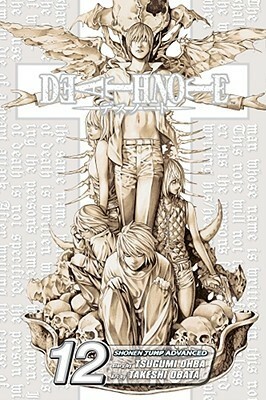 The character of Misa, Light's pseudo-girlfriend, has struck a nerve with a lot of readers. 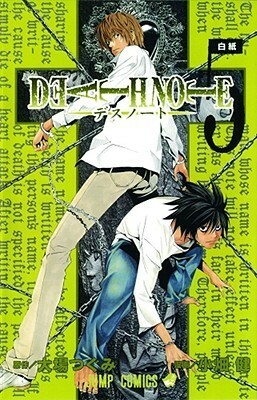 She is indeed pathetically subservient to Light, easily taken in by even his cheapest lies, and pretty dim and ineffective compared to him and L. But then, this is a series where almost every character is dim and ineffective when coming up against Light and L, and most characters are completely taken in by Light's surface charm. In the end, it's a game of chess, with massive stakes. Light and L are in control, and everyone else are just pawns. And both Light and L are well aware of that. There are twelve volumes of the manga in all, and the ending is spectacular. Sure, the basic result is all but inevitable, but the details, the exact way it unfolds is often unexpected, with more than one character surprising me. For me, it was a deeply satisfying ending, true to the characters and the plot to that point. And well worth reading through a dozen volumes to get there. It's an extended battle of wits between brilliant, flawed, and strong-willed characters, and one of the most memorable manga series I've ever read. There are certainly flaws (particularly the reliance on giant walls of text), but the series as a whole is more than worth it.